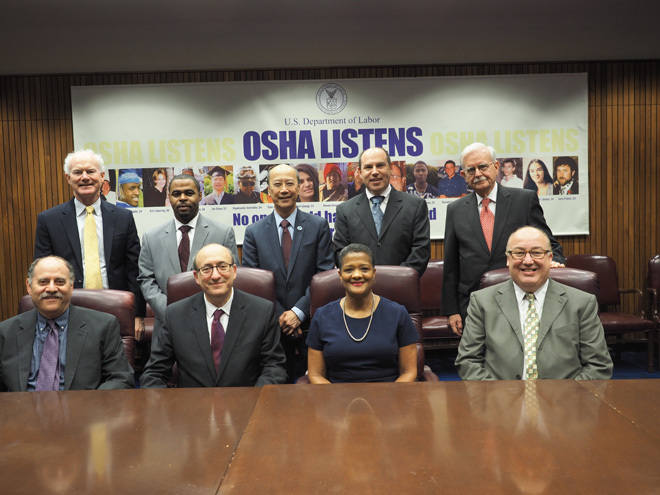 On Dec. 17, the Occupational Safety and Health Administration renewed for another five years its alliance with the National Institute for Occupational Safety and Health and Roadway WorkZone Safety and Health Partners. Standing, left to right: Brian Deery, Associated General Contractors; Kevin Canon, Associated General Contractors; King W. Gee, American Association of State and Highway Transportation Officials; Dan Glucksman, International Safety Equipment Association; and Daniel K. Shipp, International Safety Equipment Association. Seated, left to right: Scott P. Schneider, Laborer’s Health & Safety Fund of North America; Dr. David Michels, Occupational Safety and Health Administration; Dr. Christine Branche, National Institute of Occupational Safety and Health; and Brad Sant, ARTBA. The Occupational Safety and Health Administration (OSHA) Dec. 17 extended by five years its alliance with the National Institute for Occupational Safety and Health and the Roadway Work Zone Safety and Health Partners, of which ARTBA is a member. The alliance is dedicated to protecting workers in roadway construction work zones from injuries, illnesses and fatalities. Created in 2007, the alliance has developed case studies on worker fatalities in roadway work zones, produced an Infographic on the causes of the fatalities, and contributed to the development of documents and training courses to prevent falls and other construction safety hazards. The Roadway Work Zone Safety and Health Partners have distributed information on OSHA’s campaigns to prevent falls in construction and reduce the risks of heat illness. ARTBA Senior Vice President of Safety & Education Brad Sant said the success of the alliance can be attributed to two primary factors. In addition to ARTBA, the work zone safety and health partnership includes the National Asphalt Pavement Association; Laborers’ International Union of North America [LIUNA]; Laborers’ Health and Safety Fund of North America; LIUNA Training and Education Fund; International Union of Operating Engineers; Associated General Contractors of America; International Safety Equipment Association; and American Association of State Highway and Transportation Officials.